Since March 2009, the Republic of Korea Navy (ROKN) has been deploying KDX-II (Korean Destroyer Experimental II) class destroyers to the Gulf of Aden for the protection of Korean national vessels and the promotion of regional Maritime Security. These deployments were successful in terms of conducting regional Maritime Security Operations under the command of Combined Task Force 151 (CTF151) and Combined Maritime Forces (CMF). One of the KDX-II class destroyers, ROKS Wang Geon (DDH-978) has previously been assigned as the flagship of CTF 151 in the area of operation where she made outstanding contributions to the CMF and regional Maritime Security. ROKN rotates the deployments in 4-month cycles and lately the KDX-II class ROKS Munmu The Great (DDH-976) is resuming the mission in the Gulf of Aden. She was the very first ship to be deployed to the Somali waters from the Republic of Korea back in 2009, and this is her 3rd tour in the region having been in the region in 2009 and 2011. 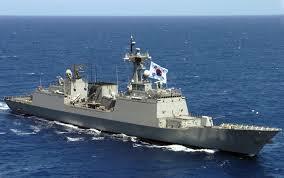 The KDX-II class destroyers are multipurpose destroyers, a versatile asset of the ROK Navy. ROKN currently employs a total of 6 KDX-II class destroyers. ROKS Munmu The Great was launched in April 2003 and is the 2nd of her class. The ship was named after the 30th King of the Silla Dynasty who unified the Korean Peninsula in 676 A.D. Munmu the Great was the first King to achieve the unification of the Korean Peninsula; he contributed to national prosperity by exerting himself and his people to adapt to a diversity of advanced civilisations and reformed national institutions. His cremated remains were scattered by the Daewang-am (“Rock of the Great King”) off the coast of Gampo, Gyeongju in 681 A.D. in accordance with his dying will said: “I shall protect my nation as the dragon of the Sea and death will not come against it.” His noble spirit will surely live on, and his wish to protect the nation and guard our seas will be, without a doubt, succeeded by ROKS Munmu the Great. ROKS Munmu the Great was designed with the capacity to operate across the vast expanse of the world’s seas and oceans. She is armed with the state-of-the-art weapons system: SM-2 Block IIIA, RAM, surface-to-surface missiles (Harpoon), 127 mm naval gun, 30 mm Goalkeeper Close-In Weapons System (CIWS) and K-6 machine guns. As for electronic equipments, ROKS Munmu The Great operates a variety of detection and tracking devices such as the AN/SPS-49(V)5 2D Long-Range Radar (LRR), MW08 3D Target Indication Radar (TIR), STIR fire-control radars with OT-134A Continuous Wave Illumination (CWI) transmitters and SLQ-200(V)K SONATA electronic warfare system, etc. In addition, she is also able to carry two LYNX Helicopters and three Rigid Inflatable Boats.